High definition and standard definition video equipment is available for rent. Our video editing suite is available for rent to producers and editors who want to work with their customers downtown in a comfortable, well-equipped post-production environment. Please contact us with your rental needs so that we may provide you with a rental quote. 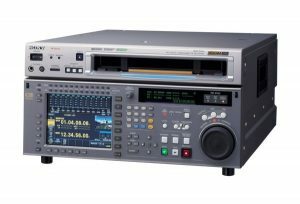 The SRW-5500 is Sony’s first dual format recorder, switchable between Sony’s HDCAM and HDCAM SR record formats. Capable of recording 23.98/24/25/29.97/30PsF, 1080/50i/59.94/60i, and 720/59.94P, the SRW-5500 was created to meet all common worldwide delivery requirements. The HDCAM SR format is capable of recording the gamut of HD frame/line rates in both 4:4:4 and 4:2:2 formats using the highly efficient MPEG-4 Studio Profile compression scheme. The SRW-5500 records HDCAM SR format video at 440 Mbps, 10 bit Log or linear, at 2.7:1 compression ratio in 4:2:2, and 4.2:1 compression ratio for 4:4:4. It can also record 12 channels of audio at 24-bit per sample resolution. HDCAM format recording offers the standard 4 channels of uncompressed audio. Includes the HKSR-5001 and HKSR-5003 option boards. 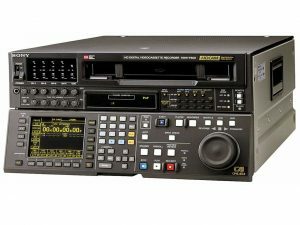 High-Definition editing recorder utilizing HDCAM compression and 4 channels of audio. 1920×1080 switchable 23.976psf, 24p, 25p, 29.97p, 30p, 50i, 59.94i, 60i. Includes HDKV-501a downconverter board and HKDV-507 pulldown board. 4 channels of audio. The standard definition digital workhorse of the industry. Plays and records Digital Betacam and plays analog Beta SP. SDI, component and composite inputs and outputs, 4 channels of audio. 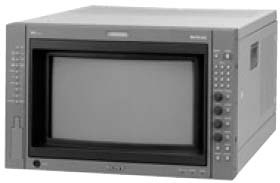 The standard definition analog workhorse of the industry. 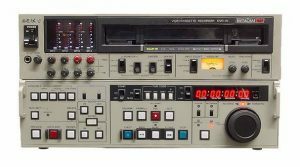 This Betacam deck plays and records Beta SP and plays regular Betacam. Component and composite inputs and outputs, up to 4 channels of audio. 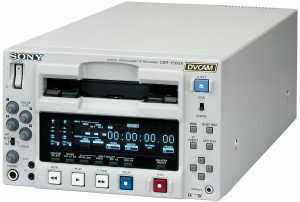 The DSR-1500 employs the DVCAM format, the professional extension of the worldwide standard DV format. The DVCAM format uses 8-bit digital component recording with a 5:1 compression ratio and a sampling rate of 4:1:1 for NTSC. SDI input, SDI, component and composite out. 2 channels 48k audio, 4 channels 32k audio. 14” Multi-scan monitor with two HD-SDI inputs and one component analog input. 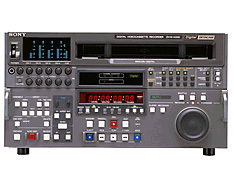 Small, lightweight, portable battery and AC powered MiniDV deck with Firewire, S-Video and composite inputs and outputs.